Not to be confused with Quezon City in Metro Manila. For other places with the same name, see Quezon (disambiguation). Quezon (UK: /ˈkeɪzɒn/, US: /ˈkeɪsɒn, -sɔːn, -soʊn/, Tagalog: [ˈkɛson]) is a province of the Philippines in the Calabarzon region of Luzon island. The province was named after Manuel L. Quezon, the second and first freely Elected President of the Philippines. Lucena is the provincial capital, seat of the provincial government and the most populous city of the province, but is governed independently as a highly urbanized city. To distinguish the province from Quezon City, it is sometimes called Quezon Province. Quezon is southeast of Metro Manila and is bordered by the provinces of Aurora to the north, Bulacan, Rizal, Laguna and Batangas to the west and the provinces of Camarines Norte and Camarines Sur to the east. Part of Quezon lies on an isthmus connecting the Bicol Peninsula to the main part of Luzon. The province also includes the Polillo Islands in the Philippine Sea. Some marine parts of the Verde Island Passage, the center of the center of world's marine biodiversity, are also in the province. A major tourism draw to the province is Mount Banahaw. The mountain is surrounded by spiritual mysticism with many cults and religious organizations staying on the mountain. The mountain was also one of the most sacred sites for pre-colonial Tagalog people before the arrival of the Spanish. Numerous pilgrims visit the mountain especially during Holy Week. Archaeological excavations in the province attest to its rich precolonial past. Archaeological materials including burial jars, human bones, shell midden and pot shreds have been discovered at different sites in Bondoc Peninsula including the towns of San Narciso, San Andres, Mulanay and Catanauan. The most recent excavations were conducted in Catanauan by the Catanauan Archeological and Heritage Project. According to the preliminary report released by the Catanauan Archaeological and Heritage Project, several excavations were conducted in the 1930s. One of the excavations was conducted in San Narciso where archaeologists found burial jars. The site, inspected by Ricardo Galang, resulted in the discovery of burial jars near the coast. Galang also went to San Andres where excavations yielded 14th and 15th century ceramics as well as shell bracelets and beads. According to the journal as well, at a site named Tala, archaeologists discovered a glazed Chinese jar containing bone fragments from the early Ming dynasty. Looking at other archaeological sites located in adjacent areas like Marinduque and Masbate, it can be inferred that these excavations date back to the metal period of the archipelago. In 2012, at Mt. Kamhantik in the town of Mulanay, 15 limestone coffins were discovered. Carbon dating on a human tooth found it to be at least 1,000 years old. According to the archaeologists, the village is proof that the ancient inhabitants of the area practiced a more sophisticated way of life. Metal tools are believed to have been used to carve the coffins, and this is the first of its kind discovered in the archipelago. The remains are said to date back to the 10th to 14th century. Originally, what now forms Quezon was divided among the provinces of Batangas, Laguna, and Nueva Ecija. However, at different points in time, the boundaries of Quezon changed and included parts of Aurora, Marinduque, and Camarines Norte. At the early period of Spanish colonization, the province of Aurora was called El Principe, Infanta was called Binangonan de Lampon and southern Quezon was called Kalilayan. The first European to explore the area was Juan de Salcedo in 1571–1572, during his expedition from Laguna to Camarines provinces. In 1574, Father Diego de Oropesa, founded the town of Bumaka, now known as the municipality of Gumaca. In 1591, the province was created and called Kaliraya or Kalilayan, after the capital town which later became Unisan. In 1595, The Diocese of Cáceres was established by Pope Clement VIII as a suffragan of Manila. The diocese covered the entire Bicolandia region plus the towns in Kalilayan, and the Contracosta towns. At that time, the towns on the eastern seaboard were pertained to as the Contracosta and included towns from Mauban, Binangonan de Lampon, to El Principe. The destruction of Kalilayan in 1604 by a big fleet of Moro pirates caused the inhabitants to transfer to Palsabangon (Pagbilao). Depredation and plunder by the Moros from Jolo and Brunei were rampant during the 1600s. Slavery is one reason for the proliferation of these raids. A padron for Calilaya was ordered after Tayabas suffered severely from Moro raids. It is said that 187 people were either captured or killed while 400 people fled. Fear from these raids are the primary reason as to the permanent movement of settlements along the coast further inland as well as a general decline in population. Frequent invasions by the moros disrupted the food production in the province, affecting the nutrition of its inhabitants. Maternal malnutrition was even cited as one of the primary causes of infant mortality at that time. By 1701, the previously densely settled coastal areas of the province, was described as consisting of rancherias whose inhabitants depended on wild products. In 1705, the Military Comandancia of Nueva Ecija was created and was governed by Governor General Fausto Cruzat. It included huge swathes of Central Luzon, the Contracosta towns as well as the Kalilayan area. In 1749, the capital was transferred to the town of Tayabas, from which the province got its new name. In a report by a Spanish priest named Fr. Bartolome Galan in 1823, he describes the economy of the province. According to his report, Tayabas had poor soil and the terrain is hilly which meant that conditions were not that suitable for agriculture compared to other places. The people grew upland rice, wheat, beans and vegetables. Surplus rice was sold in San Pablo and Majayjay during Mondays, the market day of those towns. Cattle breeding was rampant in towns like Tayabas, Pagbilao, Tiaong, and Sariaya. Also, unlike other provinces, haciendas were not so many in Tayabas. Instead, residents owned most of their own land. The people of Tayabas, as in other areas, are actively trading with Manila. Santa Cruz, Laguna was the entropot for all goods going to the capital. The people from Lucban made products of buri and pandan leaves like hats, sleeping mata and the like which they traded. They, along with the people of Mauban also went to Polillo, at that time part of Nueva Ecija, to buy sea slugs, shells and beeswax. Being a rich agricultural area, the town of Tayabas traded rice, coconuts, and panocha with nearby towns of Majayjay, Lucban, Sariaya, Pagbilao, Mauban, Gumaca and Atimonan. In turn, they traded fish from Pagbilao, rice from Sariaya, and high quality abaca products from Mauban and Atimonan. Lucban, as well as Tayabas, benefitted greatly from the high commercial activity of Chinese and Chinese mestizos in the pueblos. Gumaca, being a town with little arable land depended heavily on the sea. They collected sea slugs, and tortoise shell from Alabat and traded with the mountain people there for beeswax in exchange for clothing. They even sometimes ventured to Burias Island in the Ragay Gulf in search for these goods. These products were then sent to Tayabas for shipment to Manila. Gumaca also traded items from nearby pueblos like vinegar and clothing for gold and abaca from Naga in the Bicol region. It was also around this time that the Confradia de San Jose was active in the province, caused by the growing inequality between the poor and the upper classes. This organization was directed mostly on the poor and neither admitted Spaniards, nor Mestizos. In 1853 the new military district of Tayabas was carved from Nueva Ecija and included present-day Southern Quezon as well as present-day Aurora. In 1858, Binangonan de Lampon and the Polilio Islands were separated from Nueva Ecija to form part of Infanta. According to the CBCP, the two Franciscan friars named Fray Juan de Plasencia and Fray Diego de Oropesa were the ones responsible for bringing Christianity to the area. The Franciscans are also credited for spreading Christianity to towns and parishes across the province including Mauban, Sariaya and Gumaca. Between 1855 and 1885, El Principe was established as its own Military Comandancia with its capital in Baler. After years under the Spanish regime, the colonized people grew discontented with the Spaniards over the centuries. The most important event in the history of the province was the Confradia Revolt in 1841, which was led by the famous Lucbano, Apolinario de la Cruz, popularly known as Hermano Pule. The province, under General Miguel Malvar, was also among the earliest to join the Philippine Revolution. The Revolutionary Government took control over the province on August 15, 1898. The Americans then came and annexed the Philippines. A civil government was established in the province on March 12, 1901, and Lucena was made the provincial capital. During the pacification of the archipelago by the Americans, insurrections were a commonplace in what was then Tayabas. Insurgents from neighboring provinces of Laguna and Batangas often use Tayabas as their base of operations as well as their source of supplies. An insurgent government, with connections to Gen. Malvar and Pedro Caballes was even said to be based in Infanta. This has led the American in charge, Brigadier-General J.F. Bell to decide to return to Tayabas with a larger contingent. Bell acknowledged the importance of the ports of Tayabas as sources of supplies to the insurrection such that he believed that closing all the ports in the province might convince the leaders of the resistance to surrender. In 1902, the district of El Principe was transferred from the jurisdiction of Nueva Ecija to Tayabas. In the same year, Marinduque became part of Tayabas province by virtue of Act 499 enacted by the Philippine Commission. However, by 1920, Act 2280 was passed by the Philippine Congress, reestablishing Marinduque as a separate province. Because of the distance between Tayabas and Bicol and the growing population, Tayabas came under the jurisdiction of the Diocese of Lipa in 1910. Even before the Philippines gained its independence, the province has already depended heavily on coconuts. This history can clearly be seen through the opulent houses built in the town of Sariaya during this period. Coconuts served as the main source of income for the landed class of Sariaya and this allowed them to build the ancestral houses that we see today. This has led some companies like Peter Paul to establish its presence in Candelaria to manufacture products like desiccated coconut. as early as this period. In June 1951, the northern part of Quezon (specifically, the towns of Baler, Casiguran, Dilasag, Dingalan, Dinalongan, Dipaculao, Maria Aurora and San Luis) was made into the sub-province of Aurora. Aurora was the name of the president's wife, Aurora Quezon. Aurora was finally separated from Quezon as an independent province in 1979. "Camarines Norte and Tayabas boundary. – The boundary separating the Province of Camarines Norte from the Province of Tayabas begins at a point on the eastern shore of Basiad Bay and extends to a peak known as Mount Cadig in such manner as to bring the territory of the barrio of Basiad entirely within the municipality of Capalonga, in Camarines Norte, and to exclude the same from the territory of Calauag, in Tayabas. From Mount Cadig it extends along the crest of a mountain range, a distance of 50 kilometers, more or less, to a peak known as Mount Labo; thence in a southwesterly direction, a distance of 25 kilometers, more or less, to a prominent stone monument at the source or headwaters of the Pasay River, thence along the meandering course of said river in a southerly direction, a distance of 1½ kilometers, more or less, to the Gulf of Ragay." "Starting from the peak of Mt. Labo as a common corner between the provinces of Tayabas, Camarines Sur and Camarines Norte thence a straight line is drawn to the peak of Mt. Cadig; thence a straight line is drawn to the point of intersection of the inter-provincial road between Camarines Norte and Tayabas with the Tabugon River; thence, following the course of the river to its mouth at Basiad Bay." In the legal dispute, Quezon raised two points of contention. First is that Act 2711 already delineated the boundaries of the province. Second is that the Chief of the Executive Bureau had no power nor authority to change the boundaries of the province. Regarding the first issue, the court stated that it is true that Act 2711 delineated the boundary but it did not delineate the entirety of the boundary. The point on the eastern shore of Basiad Bay was never specifically located, thus, needing further delineation. On the second issue, the court stated that the Chief did not alter the borders in any way. The Chief worked with the requirement that the point be on the eastern shore of Basiad Bay. He was also acting on the consideration of Act 2809, the Act establishing Camarines Norte, which states that Camarines Norte be established with the borders it had before merging with Camarines Sur. The court then ruled in favor of Camarines Norte and ordered the provincial government of Quezon to transfer all its authority and jurisdiction to the former. By 2001, the Provincial Government of Quezon, this time represented by Governor Eduardo Rodriguez, the Provincial Government of Camarines Norte, as represented by Governor Roy Padilla, went back to court. Even with the judgment on the 1989 case was executory by 1990, the provincial government of Quezon did not abide by the court's ruling. In 1991, a DENR technical team conducted a survey of the area and erected a monument marker to delineate the boundary of the area. However, by October 1991, Quezon Governor Eduardo Rodriguez and Calauag Mayor Julio Lim caused the removal of the marker. Throughout the proceedings, several government agencies including the Department of Budget and Management, Comelec, as well as the Philippine Statistics Authority recognized the jurisdiction of the town of Santa Elena, Camarines Norte over the 9 barangays. In 2000, Judge Regino held Governor Rodriguez and Mayor Lim guilty of contempt, with a maximum imprisonment of 6 months as well as a fine of 1,000 pesos for the erection of a new boundary marker. In 2007, Republic Act No. 9495 was proposed to further divide Quezon into Quezon del Norte and Quezon del Sur. (see Quezon del Sur creation plebiscite, 2008) Quezon del Norte was to be composed of the first and second congressional districts of the province (Burdeos, General Nakar, Infanta, Jomalig, Lucban, Mauban, Pagbilao, Panukulan, Patnanungan, Polilio, Real, Sampaloc, Tayabas, Candelaria, Dolores, San Antonio, Sariaya, Tiaong and Lucena), with Lucena as its capital. Quezon del Sur, with its capital at Gumaca, would have been composed of the third and fourth congressional districts (Agdangan, Buenavista, Catanauan, General Luna, Macalelon, Mulanay, Padre Burgos, Pitogo, San Andres, San Francisco, San Narciso, Unisan, Alabat, Atimonan, Calauag, Guinayangan, Gumaca, Lopez, Perez, Plaridel, Quezon and Tagkawayan). The act lapsed into law without the signature of President Gloria Macapagal-Arroyo on September 7, 2007. As required by law, the COMELEC held a plebiscite on December 13, 2008, 60 days after Republic Act No. 9495 took effect. The majority of the votes cast rejected the division, therefore the split did not push through. Quezon, east of Metro Manila, is the 8th largest province in the Philippines having an area of 8,989.39 square kilometres (3,470.82 sq mi). It is the largest province of Calabarzon, comprising 879,660 hectares or 53.21% of the total land area of the region. Of this area, 513,618 hectares is categorized as agricultural land. The northern part of the province is sandwiched between the Sierra Madre mountain range and the Philippine Sea. The southern part consists of the Tayabas Isthmus, which separates the Bicol Peninsula from the main part of Luzon Island, and the Bondoc Peninsula which lies between Tayabas Bay and Ragay Gulf. Because of this, majority of towns in the province have access to the sea. The province is bounded by the provinces of Aurora, Bulacan, Rizal, Laguna, Batangas, Camarines Sur and Camarines Norte. It is bounded to the east by the Pacific Ocean and to the south by Tayabas Bay. The province is said to be characterized by a rugged terrain with patches of plains, valleys and swamps. The major islands of Quezon are Alabat Island and Polillo Islands. Mount Banahaw, an active volcano, is the highest peak at 2,169 metres (7,116 ft). It supplies geothermal power to the Mak-Ban Geothermal Power Plant. The province has a total of 1,066.36 km of coastline and has several bays including Burdeos Bay, Lamon Bay, Calauag Bay, Lopez Bay, Ragay Gulf, Pagbilao Bay and Tayabas Bay. The Infanta Watershed has extensive and highly productive aquifers while Mauban and Atimonan have no significant groundwater. According to the DENR, in 2003, Quezon had 231,190 hectares of forest cover. However, due to rampant illegal logging as well as kaingin, these forests are constantly threatened. Because of the sheer size of Quezon, different areas have different climate patterns. Most of the province falls under Type IV Climate which means that rains are evenly distributed throughout the year. Polillo, Infanta and parts of Calauag fall under Type II climate which means that there are no dry seasons but there is a pronounced wet season from November to April. Parts of the western towns of Tiaong, San Antonio, Dolores and Candelaria as well as the tip of Bondoc Peninsula including parts of Mulanay, San Francisco, San Narciso and San Andres fall under Type III climate. This means that there is a relatively dry season from November to April. Although these are the patterns observed, it is important to note that with climate change, these patterns have become more erratic. Typhoons have become stronger through the years, causing problems such as power outages, road blockages, landslides, flashfloods and crop damages. Quezon comprises 39 municipalities and one component city named Tayabas City, which are organized into four legislative districts and further subdivided into 1,209 barangays. The capital, Lucena City, is independent from the administrative and fiscal supervision of the province, but is eligible to vote for provincial officials. ^ Total figures exclude the highly urbanized city of Lucena. In the 1800s when Jean Mallat de Bassilan conducted a survey of the province, it only had 17 towns. When the Census of the Philippine Islands was conducted in 1902 during the American era, Tayabas, excluding the subprovince of Marinduque, had a total population of 153,065. 2,803 were considered as wild, or part of the non Christian tribes like the Aetas while 150,262 people were considered as civilized. Of the civilized population, 75,774 were males while 74,488 were female. 287 were of mixed descent while the rest are categorized as "Brown". The population of Quezon in the 2015 census was 1,856,582 people, with a density of 210 inhabitants per square kilometre or 540 inhabitants per square mile. When Lucena City is included for geographical purposes, the province's population is 2,122,830 people, with a density of 234.06234/km2 (606.21606/sq mi). The inhabitants are mostly Tagalogs. The population is concentrated in the flat south-central portion which includes Lucena City, Sariaya, and Candelaria. After World War II, Infanta and surrounding towns received migrants from Manila, Laguna, Rizal and Batangas. People from Marinduque moved to the southern part of the Tayabas Isthmus and the Bondoc Peninsula. Bicolanos from Bicol Region migrated to the easternmost towns of Calauag and Tagkawayan. Philippine Chinese also have a long history in Quezon.In 1939, the province ranked 5th among all provinces including Manila in terms of the concentration of Philippine Chinese. This ethnic group has a long history of being active in business and commerce as shown by the business chambers existent before. However, as the Chinese intermarried with locals, these groups have dwindled in number. The province used to be home to various Aeta tribes. Other terms used to call them include "Umag", "Ata", "Atid", and "Itim". The Aeta used to clear coconut plantations and other odd jobs in exchange for food or clothing. These people, though seem as uncivilized by some, have a very rich culture. Some forms of their art include body scarification. The Aeta cause wound on their skin in various parts of their body including back, arms, legs, hands, calves and abdomen. They then irritate them during healing using fire, lime and other materials to form scars. They also bore holes on their septum and then proceed to decorate it with a sliver of bamboo. The Aeta also have various musical instruments like the nose flute and the gurimbaw, a stringed instrument made of coconuts, fibers from lukmong vines and bamboo. There are five indigenous languages in Quezon province. There are the dominant Tagalog language, the Manide language in the east and a small portion in the north, the Agta Dumagat Umiray language in the north and a small area in the center, the already-extinct Katabaga language which used to be in the south, and the endangered Ayta Kadi (Alabat Agta) language in Alabat island and some areas in the south. In 2010, UNESCO released its 3rd world volume of Endangered Languages in the World, where 3 critically endangered languages were in the Philippines. One of these languages is the Alabat Island Agta language (recognized by the Komisyon ng Wikang Filipino as the Ayta Kadi language) which has an estimated speaker of 30 people in the year 2000. The language was classified as Critically Endangered, meaning the youngest speakers are grandparents and older, and they speak the language partially and infrequently and hardly pass the language to their children and grandchildren anymore. Without a municipality-wide teaching mechanism of the Ayta Kadi (Alabat Agta) language for the youth, the language may be extinct within 1–2 decades, making it a language in grave peril unless a teaching-mechanism is established by either the government or an educational institution in the municipality of Alabat. Majority of Quezon's inhabitants practice Roman Catholicism and other Christian denominations like Iglesia Filipina Independiente. Most non-Christians practice Islam, Anitism, animism, or atheism. Farming and fishing are the main sources of livelihood in the province. Commercial, industrial, and banking activities are mostly concentrated in the south-central part of the province. Quezon is the country's leading producer of coconut products such as desiccated coconut, virgin coconut oil, coconut juice, coconut oil and copra. A large part of the province is covered in coconut plantations. Several large companies geared toward processing coconuts have factories in the province. This includes companies in Candelaria including Peter Paul Philippine Corporation, Primex Coco Products Inc., Pacific Royal Basic Foods, SuperStar Corporation, and Tongsan Industrial Development Corporation which are focused on processing desiccated coconut and other specialty coconut products. Other companies in Lucena like Tantuco Enterprises, and JNJ Oil Industries on the other hand are focused on producing coconut oil and other coconut oil based products like margarine, and lard. Because of the coconut industry, copra traders from provinces like Marinduque, Romblon, and Masbate regularly visit the province. However, the coconut industry is faced with several threats from cocolisap to the coconut lumber trade. When cocolisap posed a huge threat to the coconut industry, the government had to act swiftly with countermeasures aimed at fighting the coconut scaling insect. Aside from coconuts, Quezon is also the most important agricultural province among the provinces in Calabarzon in terms of producing staple food items such as rice and corn. The province supplies 200,000 MT of rice and corn annually or around 42% of the total rice and corn requirement of the region. Other major crops are rice, corn, banana, and coffee. Because of its long coastline and the presence of numerous marshes and bays, fishing is also a large part of the province's economy. Quezon accounts for 33% or around 132,239 MT of fish produced in the region. Several fish port complexes exist in the province, including ports in Atimonan, Lucena, Infanta, and Guinayangan. These ports serve as hubs for the trade of fish and other aquatic resources like round scad, anchovies, tuna, and groupers. The province has three fishing districts. The first is found in the northeast encompassing Lamon Bay. The southeast portion includes the Ragay Gulf while the south central portion covers Tayabas Bay. Aside from fishing, aquaculture is also important in the coastal municipalities of the province. Bangus and prawns are among the most cultured species. Due to its proximity to the southern fringes of the Sierra Mountain range. Northern quezon has been a hotspot for illegal logging. Frequent raids in towns like Mauban often yield hardwood timber like Narra and Kamagong. The capital city of Lucena is considered to be the economic center of the province. There are currently three malls in the province. Two of them are located in Lucena namely SM City Lucena and Pacific Mall Lucena. Citymall, located in Tiaong, is the third mall in the province. Major banks like BDO, Metrobank, Land Bank, BPI, PNB, RCBC UCPB, among other Manila-based banks are present in the western part of the province. BDO however made a move to establish a regional head office at Lucena due to the growing demand and economic importance of the province itself. On the other hand, namely QCRB, Rural Bank of Atimonan and Card Bank rural banks serve the far-flung towns. Manila South Road, part of Pan-Philippine Highway (N1/AH26), in Sariaya. Quezon has a total of 931 kilometres (578 mi) of national roads, mostly paved with concrete. Pan-Philippine Highway (N1/AH26), which comprises most of Manila South Road, and Quirino Highway (N68), the Quezon leg of Andaya Highway form the highway backbone network, and the secondary and tertiary roads interconnect most cities and municipalities, except for Infanta, Real, and General Nakar, whose highways used to access those municipalities interconnect with the national highway network in Laguna and Rizal. The provincial government maintains provincial roads which supplements the national roads. In order to spur development in the province, several proposals have been made to expand the expressway network to Quezon. The South Luzon Expressway, which terminates at Calamba, will be extended to Tayabas with the construction of Toll Road 4 (SLEx TR-4). Two expressways being proposed for construction includes the Manila – Quezon Expressway (MQX), which will pass through Rizal and eastern Laguna, and Quezon-Bicol Expressway (QuBEx), which will link Lucena with Bicol Region. The South Line of Philippine National Railway's North-South railway passes through the different towns of Quezon from Tutuban to Bicol. This includes stops in Lucena, Malicboy, Agdangan, Plaridel, Gumaca, Lopez, Hondagua, Aloneros, and Tagkawayan. However, no trains are operating along this line as of present. The Dalahican Port and Cotta Port in Lucena provide direct access to the neighboring island provinces of Marinduque, and Romblon. The Port of Real provides access to the islands of Polillo while the Atimonan and Gumaca ports provide access to the island of Alabat. The port in San Andres provides access to Masbate and Burias islands. There exist several airports in Quezon. This includes the Lucena Airport, Pagbilao Grande Airport, Alabat Airport (Alabat Island) Jomalig Airport (Jomalig Island), and the Balesin (Tordesillas) Airport (Balesin Island). Only Balesin Airport is being used as of present for Manila-Balesin flights. Quezon is home to several power plants that supply energy to the Luzon grid. The Pagbilao Power Station is the first power plant in the province. Located at Isla Grande in Pagbilao, the 735 MW coal fueled power plant started operations as early as 1993. This power plant is currently being managed by Team Energy Corp. and is undergoing a 420 MW expansion. The Mauban Power Station is also a coal fueled power plant located in Barangay Cagsiay I. Managed by Quezon Power, the 420 MW power plant started operations in the year 2000. The third power plant, a 600 MW coal fueled plant, is currently in the planning stage and is going to be located in Barangay Villa Ibaba in the town of Atimonan. Together, these three provide jobs to the people as Quezon as well as addressing the energy needs of the province and the greater Luzon area. There are three power distributors in the province, namely Meralco, Quezon I Electric Cooperative (QUEZELCO-I), and Quezon II Electric Cooperative (QUEZELCO-II). Meralco provides electricity to the province's second district as well as the adjacent towns of Pagbilao, Lucban, Sampaloc, Mauban and Tayabas City. QUEZELCO-I distributes power to the towns of the province's 3rd and 4th districts. QUEZELCO-II distributes power to the towns of the province's first district, except for the towns served by Meralco. The Quezon Metropolitan Water District (QMWD), formerly known as the Lucena Pagbilao Tayabas Water District or LUPATA, serves the Metro Lucena area including Lucena City, Tayabas City, and Pagbilao. It draws its water largely from the May-it Spring although this source has prove inadequate to supply the area. Other towns are served by their own water districts. Some areas like the Infanta area are characterized by highly productive aquifers but other areas like Mauban and Atimonan have no significant water productivity. Due to the pressures of a growing population, Quezon is one of the provinces from which the government plans to source part of the demand for water of Metro Manila. In General Nakar, construction is ongoing as of 2016 on a tunnel to divert water from the Sumag River to Angat Dam. The tunnel will link up with the Umiray-Angat Transbasin Tunnel to provide water to Angat Dam. Aside from this, there are plans for the construction of the New Centennial Water Source Project – Kaliwa Lower Dam and the Kanan Dam in Northern Quezon for power generation and water supply of Metro Manila. The Sangguniang Panlalawigan of Quezon is against the construction of this project stating that it will not allow water from the Agos River, both on the left (kaliwa) and on the right (kanan) sides of the river. Locals fear that the construction of the project would cause massive destruction of forests, crops, animals and property in the REINA area. As of now, tourism is still a minor but growing part of the province's economy. Several attractions draw tourists from here and abroad including festivals, beaches, old structures and other sights. Among the festivals of Quezon, the three most prominent and famous are probably the Pahiyas Festival of Lucban, the Niyugyugan Festival of Quezon Province and Katang Festival of Calauag. 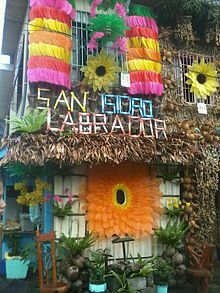 The Pahiyas Festival is the unique celebration of the people of Lucban of the Feast of St. Isidore, the patron of farmers. Held every May 15 of the year, the Pahiyas Festival is the time when neighbors compete against each other in decorating their houses in the most creative manner. The natives of Lucban use vegetables and grains like rice, chayotes and radishes as well as a special material called kiping. Kiping is an ornament made of grounded rice flour shaped into leaves and dyed in different colors. These materials serve as the ingredients for the colorful houses that the Pahiyas has become famous for. The Niyugyugan Festival is a relatively new festival started in 2012 celebrating the province's main product, the coconut. The festival celebrates the diversity of the different towns of the province through an expo. During this expo, the different towns build their own booths showcasing the best qualities of their town and then presents the products that their respective towns produce. According to journalist and international boxing judge Rey Danseco, Calauag, one of the rich coastal municipalities of the province, celebrates Katang Festival (Crab Festival). The annual colorful and exciting festivities take place several days until the 25th of May, the town's founding anniversary. Tourists from neighboring towns, provinces and other countries join the fun and witness Calaugeneans’ unique fiesta celebration and presentations of indigenous products, delicacies and different ways of cooking Katang. The Karera ng Katang (Crab Race) and Pabilisan at Paramihan ng Maitataling Katang (Crab Tying Race) are some of the highlights of festivities. The Philippines’ Department of Tourism promotes the Katang Festival as “A festival highlighting the Higanteng Alimango as their icon. The feast celebrates the abundance of mud crab in the province.“ Katang Festival has foremost aims of promoting Agro-Tourism and solidifying Calauag's distinction as source of best variety and most delicious crab and other marine products such as shrimp (hipon or swahe) and giant Asian tiger prawn (sugpo) in the Philippines. Other colorful festivals on May 15 are Mayohan Festival of Tayabas City, Agawan Festival of Sariaya, and Araña't Baluarte of Gumaca. To the north, the island of Balesin has become playground to the rich and famous. The exclusive island resort features seven uniquely themed resorts, providing its members the luxury of choosing to stay in differently themed villas. Although quite far, Salibungot beach of Jomalig is known to backpackers for its golden shores. Real on the other hand is becoming renown for surfing. Pulong Pasig in Calauag and Cagbalete Island of Mauban on the other hand are known for white beaches which become even more beautiful during low tide when the receding waters form ripples on the sand bar it leaves behind. In the south central portion of the province, the beaches of Guisguis in Sariaya have long been considered a local destination. Several resorts including Villa del Prado Resort, Dalampasigan Beach Resort and the Montevista Beach Resort are some of the resorts in the area. Quezon is home to heritage houses from the early 20th century built in the American architecture of the time such as the Enriquez-Gala Mansion, Gala-Rodriguez House and Villa Sariaya. Not only do these houses tell stories of the opulence afforded by coconut landlords but also gives us a glimpse of the uncertainty during wartime. Some of these stunning buildings are considered endangered due to road widening plans within the poblacion that will destroy these cultural icons forever. The Philippine country life is what the present Villa Escudero offers its guests. Featuring its famous waterfall restaurant, the plantation resort actually has deep historical roots tracing its origins back to the coconut growing industry of Quezon. Other Spanish-era structures also exist outside Sariaya such as the Casa de Comunidad de Tayabas, Malagonlong bridge and the churches of Lucban and Tayabas serve as testament to the history of the province. Mt. Banahaw is a pilgrimage site for some locals who believe the mountain to be holy. Although considered an active volcano, hiking has been popular with both religious pilgrims as well as hikers. There are two trails to the mountain, both originating from Barangay Kinabuhayan in the town of Dolores. The most frequently used trails are the Cristalino and Tatlong Tangke, taking an average of 9 and 5 hours, respectively but both converges at the volcano's summit. At the peak are viewpoints, labeled as Durungawan I, II, and III, which are the usual destination for pilgrims and hikers. However, due to pollution and trash left by these visitors, Mt. Banahaw was closed to the public until further notice. Quezon's food is richly influenced by the native ingredients found in the area like the coconut. As such, gata or coconut milk can be found in different dishes like ginataang suso(snail), sinugno, and pinais. As the province is relatively near Bicol, some bicolano dishes like ginataang santol and laing are relatively common in the area. Unique dishes from Quezon include Pancit Habhab, Lucban Longganisa, Chami, Lomi and dishes made of a local ferm called Pako. Other famous food items include Broas, Budin, Bonete, Kalamay, Minukmok, Tikoy, Binayo, Maruya, Pinagong, Lambanog, Yema Cake and Sapinit products. Metro Lucena has an estimated population of 700,000 which is mostly concentrated in the flat south-central portion of Quezon, which includes the cities of Lucena City and Tayabas City and the municipalities of Sariaya, Candelaria, Lucban & Pagbilao. The people are often characterized as friendly and hardworking. It is the center of commerce and tourism in Quezon Province. ^ "List of Provinces". PSGC Interactive. Makati City, Philippines: National Statistical Coordination Board. Archived from the original on January 21, 2013. Retrieved 22 November 2013. ^ "1,000-year-old village found in Philippines". Telegraph.co.uk. Archived from the original on 2017-05-01. Retrieved 2017-02-07. ^ a b c "History of Quezon Province". Provincial Government of Quezon. Archived from the original on 1 October 2016. Retrieved 4 April 2016. ^ a b Ramos, Lily O. (18 July 2012). "Quezon province's impressive historical and cultural heritage". Balita.ph. Retrieved 4 April 2016. ^ a b "Aurora, Philippines – History". www.aurora.ph. Archived from the original on 2017-02-08. Retrieved 2017-02-07. ^ "The Archdiocese | Archdiocese of Caceres". caceres-naga.org. Archived from the original on 2017-02-08. Retrieved 2017-02-07. ^ Newson, Linda (2009). Conquest and Pestilence in the Early Spanish Philippines. Hawaii: University of Hawaii Press. p. 147. ISBN 9780824832728. ^ a b Jose, Diocese of San. "Diocese of San Jose, Nueva Ecija – History". www.dioceseofsanjose.org. Archived from the original on 2017-02-08. Retrieved 2017-02-07. ^ a b c d Shiraishi, Takashi (2018). Reading Southeast Asia. New York: Cornell University. pp. 128–130. ^ a b "Diocese of Lucena". www.cbcponline.net. Archived from the original on 2017-10-04. Retrieved 2017-02-07. ^ Ramsey, Robert (2007). A Masterpiece of Counterguerrilla Warfare: BG J. Franklin Bell in the Philippines, 1901-1902. Combat Studies Institute Press. pp. 12–13. ^ "Full text of "Acts of the Philippine commission, no.1-1800"". archive.org. Retrieved 2017-02-05. ^ "Republic Act No. 14; An Act to Change the Name of the Province of Tayabas to Quezon". Chan Robles Virtual Law Library. Archived from the original on 15 January 2016. Retrieved 6 January 2016. ^ a b "The stunning, endangered heritage buildings of Sariaya". GMA News Online. Archived from the original on 2017-02-05. Retrieved 2017-02-05. ^ "Peter Paul Official Website – The Premier Manufacturer of Quality Coconut Products". www.peterpaul.com.ph. Archived from the original on 2017-02-03. Retrieved 2017-02-05. ^ "Republic Act No. 648 – An Act Creating the Subprovince of Aurora, Which Shall Comprise the Municipalities of Baler, Casiguran, Dipaculao and Maria Aurora, Province of Quezon". Chan Robles Virtual Law Library. 14 June 1951. Archived from the original on 24 April 2016. Retrieved 4 April 2016. ^ "Batas Pambansa Blg. 7 – An Act Separating the Sub-Province of Aurora from the Province of Quezon and Establishing It as an Independent Province". Chan Robles Virtual Law Library. Archived from the original on 3 March 2016. Retrieved 4 April 2016. ^ a b c d "G.R. No. 80796". www.lawphil.net. Archived from the original on 2017-02-08. Retrieved 2017-02-07. ^ "An Act Amending the Administrative Code". Archived from the original on 2012-09-23. Retrieved 7 February 2017. ^ "Province of Camarines Norte vs Province of Quezon : 80796 : October 11, 2001 : J. Sandoval-Gutierrez : En Banc". sc.judiciary.gov.ph. Archived from the original on October 12, 2016. Retrieved 2017-02-07. ^ "Republic Act No. 9495: An Act Creating the Province of Quezon del Sur". The LAWPHiL Project. September 7, 2007. Archived from the original on 25 February 2014. Retrieved 22 November 2013. ^ Jr., Delfin T. Mallari. "More legislative districts pushed in Quezon". newsinfo.inquirer.net. Archived from the original on 2017-02-07. Retrieved 2017-02-06. ^ a b c "Province: Quezon". PSGC Interactive. Quezon City, Philippines: Philippine Statistics Authority. Retrieved 8 January 2016. ^ a b c "Provincial Government of Quezon". www.quezon.gov.ph. Archived from the original on 2017-02-14. Retrieved 2017-02-13. ^ "Active Volcanoes". Philippine Institute of Volcanology and Seismology. 30 July 2008. Archived from the original on 4 March 2016. Retrieved 6 January 2016. ^ "Makiling-Banahaw". National Geothermal Association of the Philippines, Inc. (NGAP). Archived from the original on 5 June 2016. Retrieved 26 June 2016. ^ a b "State of Region's ENR". calabarzon.denr.gov.ph. Archived from the original on 2016-12-05. Retrieved 2017-02-05. ^ "Forest Cover within CALABARZON". calabarzon.denr.gov.ph. Archived from the original on 2017-02-06. Retrieved 2017-02-05. ^ A. Bertrand (1846). Les Philippines: histoire, géographie, moeurs, Volume 1. Paris. p. 266. ^ United States. Philippine Commission, 1900-1916 (1905). Census of the Philippine Islands: Taken Under the Direction of the Philippine Commission in the Year 1903 Vol 3. U.S. Government Printing Office. p. 86. ^ United States. Philippine Commission (1905). Census of the Philippine Islands: Taken Under the Direction of the Philippine Commission in the Year 1903 Vol 3. U.S. Government Printing Office. p. 16. ^ United States. Philippine Commission (1905). Census of the Philippine Islands: Taken Under the Direction of the Philippine Commission in the Year 1903 Vol. 2. U.S. Government Printing Office. p. 210. ^ Wernstedt, Frederick; Spencer, Joseph (1967). The Philippine Island World: A Physical, Cultural, and Regional Geography. University of California Press. p. 425. ^ Wong, Kwok-Chu (1999). The Chinese in the Philippine Economy, 1898-1941. Quezon City: Ateneo University Press. p. 17. ^ "UNESCO Atlas of the World's Languages in danger". www.unesco.org. Archived from the original on 18 December 2016. Retrieved 2 May 2018. ^ Jr., Delfin T. Mallari. "Almost P200K worth of illegally cut coconut lumber seized in Quezon". newsinfo.inquirer.net. Archived from the original on 2017-02-06. Retrieved 2017-02-05. ^ Jr., Delfin T. Mallari. "War against coconut pest starts in Quezon province". newsinfo.inquirer.net. Archived from the original on 2016-11-01. Retrieved 2017-02-05. ^ a b "Provincial Commodity Investment Plan" (PDF). Archived (PDF) from the original on 6 February 2017. Retrieved 5 February 2017. ^ Locsin, Joel (May 2015). "Cops Seize P4.5M worth of illegally cut logs in Quezon Province". GMA News. Retrieved September 20, 2018. ^ "SOUTH LUZON EXPRESSWAY (SLEX) TOLL ROAD 4 (TR-4) | Department of Public Works and Highways". www.dpwh.gov.ph. Archived from the original on 2017-02-06. Retrieved 2017-02-06. ^ "Manila-Quezon Expressway | Department of Public Works and Highways". www.dpwh.gov.ph. Archived from the original on 2017-02-06. Retrieved 2017-02-06. ^ "QUEZON–BICOL EXPRESSWAY | Department of Public Works and Highways". www.dpwh.gov.ph. Archived from the original on 2017-02-06. Retrieved 2017-02-06. ^ "Route Map". www.pnr.gov.ph. Archived from the original on 2017-02-08. Retrieved 2017-02-07. ^ "BusinessWorld | Pagbilao expansion seen operational in late 2017". www.bworldonline.com. Archived from the original on 2018-01-30. Retrieved 2017-02-05. ^ "Quezon Power (Philippines), Limited Co". www.qpl.com.ph. Archived from the original on 2017-02-04. Retrieved 2017-02-05. ^ "Our Business | MGen". www.meralcopowergen.com.ph. Archived from the original on 2017-02-06. Retrieved 2017-02-05. ^ "news_quezon". www.lwua.gov.ph. Archived from the original on 2017-02-18. Retrieved 2017-02-17. ^ Asian Development Bank (2010). "Water District Management Sector Project" (PDF). Subproject Appraisal Report: Quezon Metro Water District. 4. Archived (PDF) from the original on 2017-02-18. ^ a b Jr., Delfin T. Mallari. "1 dead, 5 missing as flood hits MWSS tunnel in Quezon". newsinfo.inquirer.net. Archived from the original on 2017-02-08. Retrieved 2017-02-07. ^ a b c Bello, John. "Local govts, residents reject construction of dam for power generation, Metro Manila water supply | BusinessMirror". www.businessmirror.com.ph. Archived from the original on 2016-03-31. Retrieved 2017-02-07. ^ "The Pahiyas Festival – Lucban San Isidro Pahiyas Festival". Archived from the original on 2017-02-06. Retrieved 2017-02-05. ^ "Provincial Government of Quezon". www.quezon.gov.ph. Archived from the original on 2017-02-06. Retrieved 2017-02-05. ^ "Katang Festival – Calauag Annual Foundation Celebration". Archived from the original on 2016-12-04. Retrieved 2017-05-25. ^ "Katang Festival – Calauag Foundation Celebration". Archived from the original on 2017-06-14. Retrieved 2017-05-25. ^ corporation, alphaland. "Balesin Island: Overview". www.balesin.com. Archived from the original on 2016-12-28. Retrieved 2017-02-05. ^ "Heritage group protests DPWH road-widening project in Sariaya, Quezon". GMA News Online. Archived from the original on 2017-02-06. Retrieved 2017-02-05. ^ a b "The flavors of Quezon province". GMA News Online. Archived from the original on 2017-02-08. Retrieved 2017-02-07. ^ "Quezon delicacies". Archived from the original on 2017-02-08. Retrieved 2017-02-07.